Moonam Naal Njayarazhcha malayalam movie, the directorial debut of T.A Razak will feature Salim Kumar, Samuthirakani and Babu Antony and Jyothi Krishna in lead. Produced by Salim Kumar, the movie zooms into the pathetic social status of people who are forcefully converted to different religious believes. After the final cut, the movie will be released in the coming month. T A Razak is much familiar among the movie lovers for his humanitarian stories penned for movie including Perumazhakalam, Kanakinavu and Bhoomigeetham. Now Razak is taking a step forward wearing the gown of the director. Titled 'Moonam Naal Njayarazhcha', the theme of the movie stands ahead of time which zooms into the pathetic social status of people who are forcefully converted to different religious believes. T A Razzaq had been keeping his presence alive in the malayalam film industry as a script writer and has scripted a number hit malayalam movies. T A Razzaq who himself has scripted for 'Moonam Naal Njayarazhcha' which the director had been carrying in his mind for the past 25 years. Razzaq planned the story keeping mega star Mammootty in mind took a lean back and now keep his next for the actor. 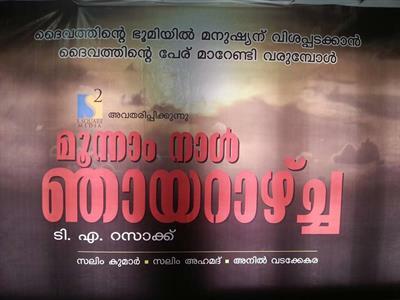 The cream of 'Moonam Naal Njayarazhcha' is about religious conversion and the troubles faced by several humans who had to change the name of the God they worship to overcome poverty. The movie will be shot in locations set at Thodupuzha and Dubai. Salim Kumar, Samuthirakani and Babu Antony and Jyothi Krishna have lent their face donning prominent roles in the movie. Produced by Salim Kumar, 'Moonam Naal Njayarazhcha' would be a perfect choice for the movie enthusiasts who wish to keep their time which travels in a parallel line. Born and brought up under humble backgrounds, Razak was much ambitious from his young days and used to write plays. Starting his journey as writer from the age of 13, Razak continued his routine of writing plays and directing them. Giving high regard to topics giving prime importance to relevance and time, his stories had the real smell of villagers. Jyothi Krishna who stepped into the film industry with 'God For Sale' is much ambitious about this project which carries a social message. Young beauty Jyothi would play reel wife to Salim Kumar in 'Moonam Naal Njayarazhcha' and has given high confidence donning a serious character which gave her the platform to showcase her skills.